Are you ready to get a new take on a classic fishing boat? Meet the all new 190 Montauk for 2018. 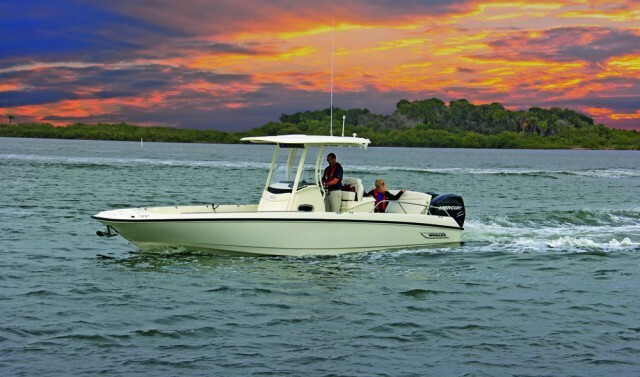 When it comes to fishing boats, few can match the legendary status of Boston Whaler. And one of its epic offerings has always been the Montauk line. Small, simple, rugged and tough, you’ll see Montauks running through virtually every waterway in the nation. This year, however, you’ll start seeing a slightly different Montauk. If you spend some time on boats.com, you’ll actually find that we’ve taken a close look at Montauks plenty of times in the past. We shot a video boat review on the past version of the 210 Montauk, and the 150 Montauk was named “My Favorite Boat” by one of our staffers back in 2013. So, how does the new version differ from the Montauks of yesteryear? Let us count the ways. 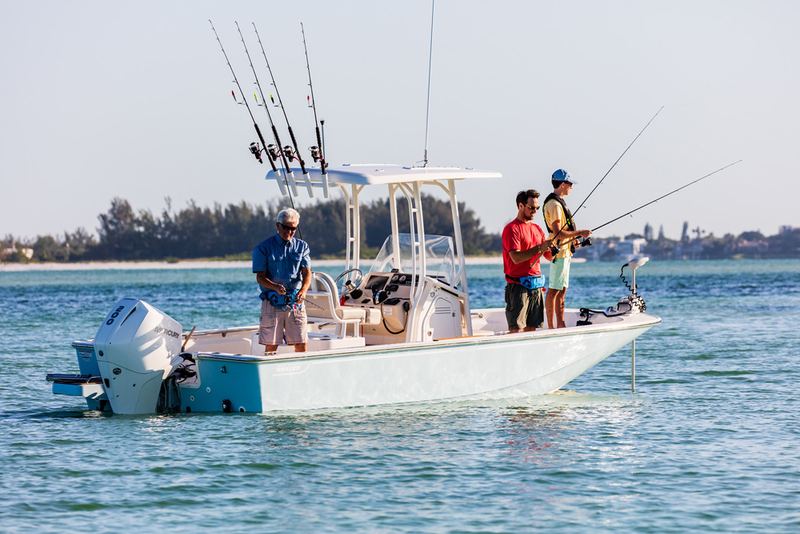 For 2018 Boston Whaler has made some changes to this classic, which we checked out at the Miami International Boat show when we shot this First Look Video. For starters, the new 190 is packaged differently than it would have been through much of the model’s history. Today it comes with a standard galvanized trailer with a swing-away tongue (for compact garage storage), LED lights, and disc brakes. Recognizing that the majority of boat owners buying in this size range will keep their boat on a trailer, selling it with a properly matched rig as part of the package makes good sense. 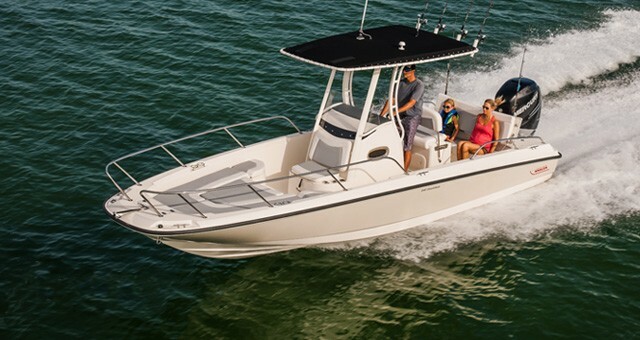 Since both Boston Whaler and Mercury Marine are owned by the same parent company, Brunswick, it also makes sense that the 190 Montauk comes with a Mercury Motor hanging on the transom; a 115 HP FourStroke outboard is standard, and there’s an optional upgrade for a 150 HP FourStroke. 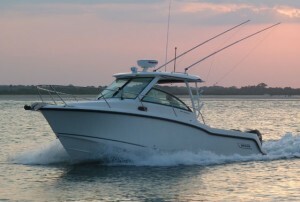 Naturally, the Boston Whaler 190 Montauk comes with a Mercury FourStroke outboard. You get to choose whether you’d like 115 or 150 horses. One of the nicer changes for 2018 has to do with the boat’s appearance, and is something of a throw-back: after eliminating all wood from the boat for ease of maintenance, the new 190 has an available teak package which decks the swim platform and helm footrest in traditional woodwork. It’s a beautiful touch, and makes sense to introduce on the 60th anniversary of Whaler to satisfy the nostalgic among us. A more substantial change has to do with the forward deck layout. Whaler engineers worked hard to design in an overboard-draining fishbox in the foredeck, without losing the separate dedicated anchor locker. Added bonus: the hatch, which is fully finished on both sides, swings up on a gas-assisted strut. Sunbathers can ignore that fishbox, and instead slide the optional removable sun-lounge pad overtop the foredeck. Anglers will probably want to expand on the boat’s fishability by adding the Fishing Package, which includes four console-mounted rodholders, a 72-quart cooler with a backrest and cushion, and two tackle drawers. We wish the livewell was also included in the package, but Whaler considers that a separate up-charge. Another option you’ll want to mull over is the railing package, if any, that you want. 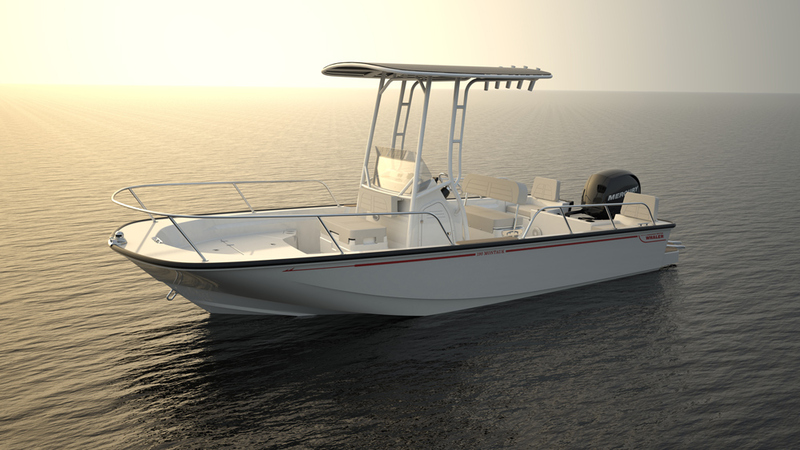 Boston Whaler is offering the 190 with both low-profile grab rails, and tall, full-blown railings. This will be a personal choice, but we’ll point out that family boaters with young children will almost certainly want to corral the kids inside the full rails. Both tall rails and low-profile grab rails are available on the 190, fore and aft. There are significant changes back in the cockpit, too. Flanking jump seats are to either side of the motor-well, just as one would expect. 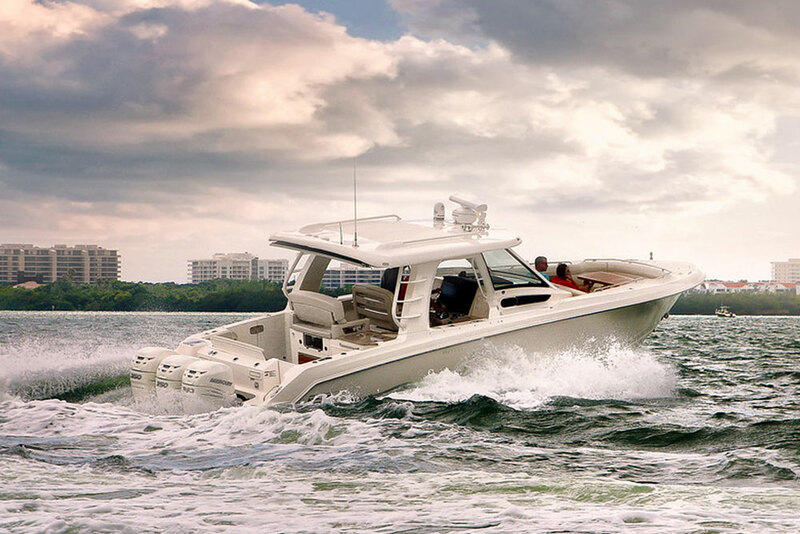 But look at the top of the transom behind them, and you’ll see two flush-mount vertical rodholders – which do double-duty as receiver mounts for the seat’s backrests. You’ll also find cupholders close at hand, in the top of the motorwell. 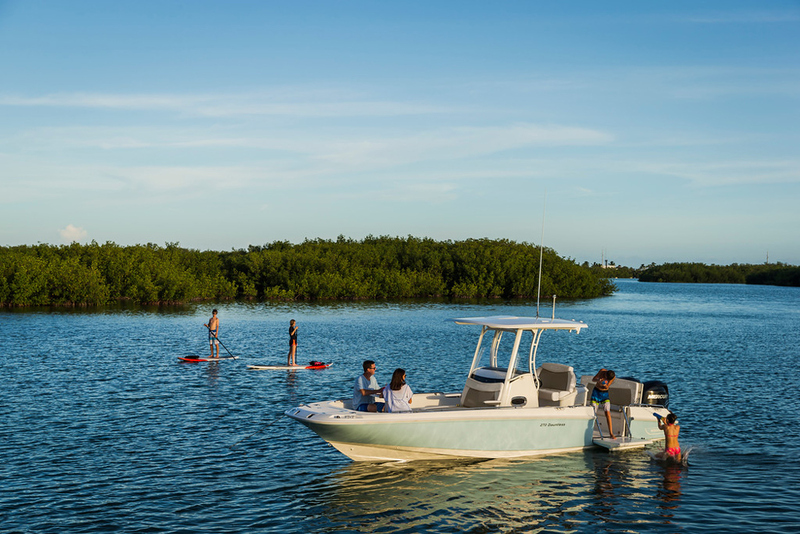 One thing that hasn’t changed one iota – with good reason – is the way Boston Whaler builds these boats. You’ve undoubtedly heard Whaler’s claims of unsinkability, which are both substantiated and on full display with the 190 Montauk. After the hull and the deck get laid up they’re mated in a mold which gets bolted shut, and closed-cell foam is then pumped between the two parts under pressure. This fills every bit of space between the two pieces of fiberglass and the foam adheres to the glass itself, solidifying the entire structure into one single chemically bonded piece. 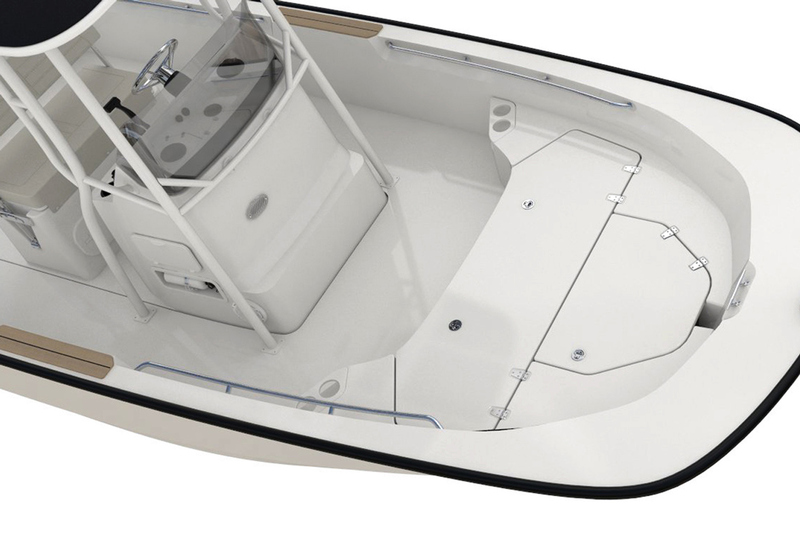 Boston Whaler terms the process “Unibond” construction. There are no belowdecks voids, the glass-foam-glass sandwich absorbs and deadens vibrations, and if you cut the hull into pieces each individual piece will remain afloat. You don’t believe it? Don’t take our word for it and don’t take Whaler’s, either—check out this nifty video of a half-boat from Whaler’s “Unsinkable” tour, and see the proof for yourself. Unibond aside, there’s little to knock about the construction of the 190 Montauk. Hinges are beefy stainless-steel, wiring is tinned-copper, and T-top pipework is rock-solid. The only place we see room for improvement lies with the console rodholders, which are plastic. We’ve asked Whaler reps about this before and they say the holders are quite hardy and don’t generate consumer complaints, but considering that all the other components are top-of-the-heap items, we’d like to see stainless-steel rodholders here, too. What exactly does the 190 Montauk cost? As we went to press the figure was still TBD. But it’s true that Whalers carry a premium, and we certainly don’t expect this boat to under-cut competitors in the same size range. That said, while it’s true that you usually get what you pay for, in this particular case it’s also important to consider resale value. The vast majority of the new boats out there devalue radically the moment you purchase them. Check out listings for used Boston Whalers, however, and you’ll quickly notice that this brand retains its value far better than most. So although you may have to pay a bit more up-front, that investment does come back to you in the long run. Here’s one other thing about the new Montauk which Boston Whaler hasn’t fiddled with: its performance. And that is indisputably a good thing. For most folks the 115 HP powerplant will provide plenty of oomph, but with 150 horses you’ll have neck-snapping acceleration and hang-on-for-dear-life blasts across the bay. Cruise at 4500 RPM is around 35 MPH, and you can run at that speed while sipping down a mere 8.4 GPH. That means you’ll be getting 4.2 MPG. The boat’s even more efficient if you can force yourself to back off on the throttle (yeah, right!) and run at 23 to 24 MPH, which produces about 5.5 miles to the gallon. Nail the throttle down, and the 190 Montauk can break 47 MPH – a rather outrageous, adrenaline-pumping speed for any 19-foot boat. It’s risky to take an iconic model like the Montauk and meddle with it. As a result, we often see builders slap a new sticker on the side of a classic hull or maybe change the boot-stripe color and then try to sell it as “new.” In some other cases, we see meddling that was meant to improve a boat actually downgrade the original. But as far as the 2018 Boston Whaler 190 Montauk goes, neither is true. In this case Whaler has designed in some significant improvements, without changing the genetics of the model. We hate to sound trite, but the legend lives on. Other Choices: There are a million and one 19 foot center consoles plying the water, but not many that truly compete with the Montauk. 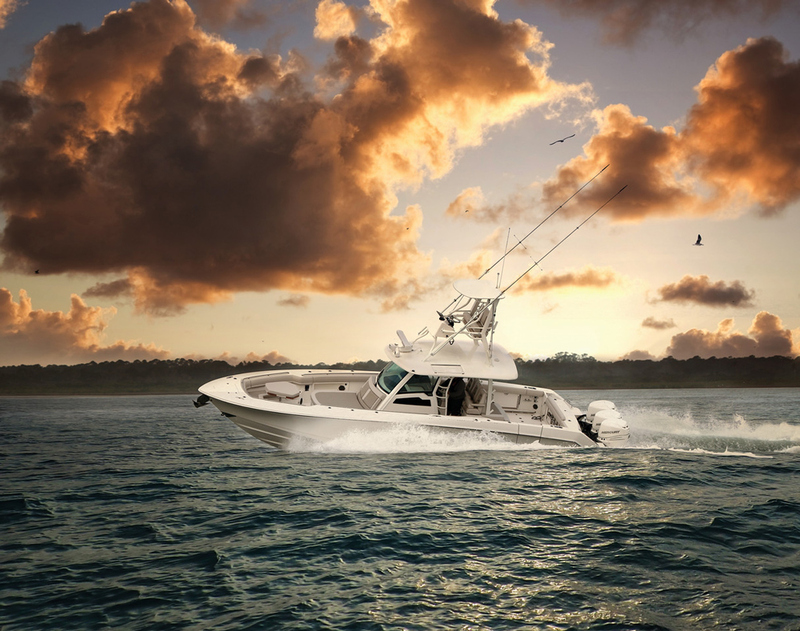 One that you may want to check out will be the Scout 195 Sportfish. 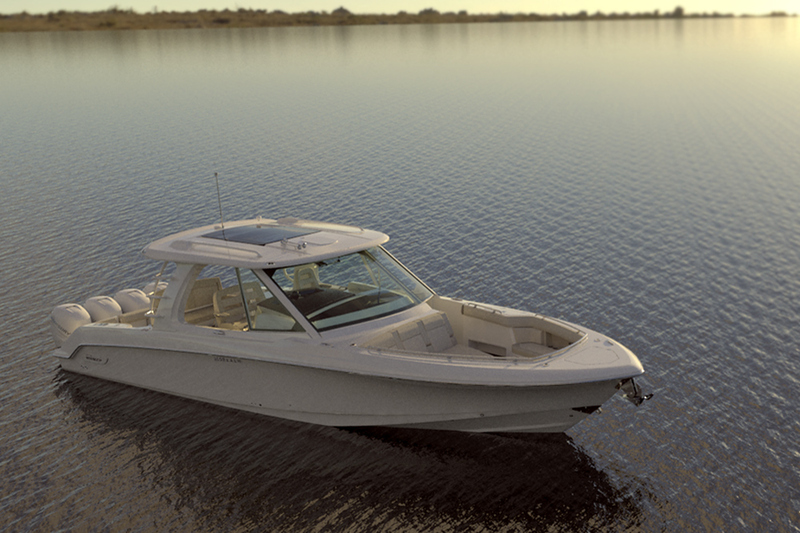 If you want a boat with higher gunwales and a head in the console, the Cobia 201 Center Console might be of interest. Same goes for the Robalo R180, one of the smallest center consoles around with a head compartment.